Most of you said “quick and easy recipes”, but I was surprsied by how many requested side dishes, desserts and more breakfasts. I love to hear that, because I love a good spiralized breakfast! 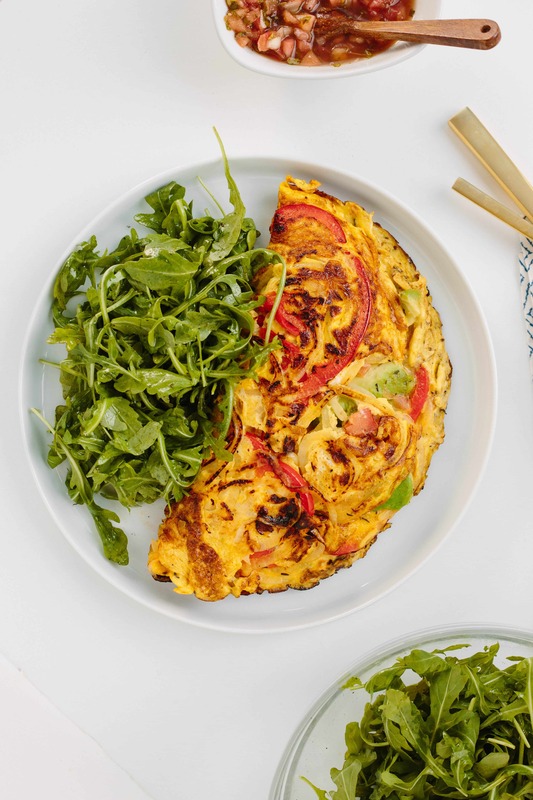 Today, I’m sharing this vegetarian version of a western omelette, using spiralized bell peppers and onions. Thus, I tend to eat the same breakfasts every day – a smoothie, an acai bowl, oatmeal with peanut butter and jelly, or avocado toast. One of my favorite omelettes to order out is a western omelette, but I usually always ask for it without ham, and the servers looks at me like I have three heads. I just LOVE bell peppers, onions, and eggs together. 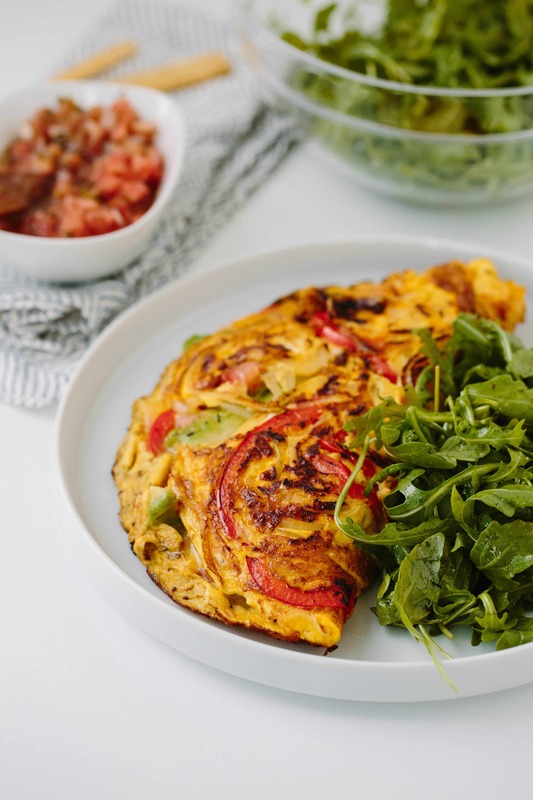 So, since this is my blog, and some of you have requested more breakfast recipes, here’s my version of a western omelette, gone vegetarian – and spiralized! Heat a 10” skillet over medium-high heat and add the olive oil. Once oil is shimmering, add the bell peppers and onions and season with thyme, salt and pepper. Cook until wilted, about 5-7 minutes. Pour over the eggs and tilt the pan to let the egg fill the bottom of the pan. Sprinkle with the tomatoes and cook for 2 minutes until eggs set on the bottom, then run a spatula around the edges and under the omelet to loosen it from the pan and flip it over. Let cook for 2 more minutes and then fold in half. Press down with the spatula to tighten the omelet. Transfer the finished omelet to a plate and top with avocado. Serve with greens, if preferred. What is the best way to store spiralized peppers and onions? I like spiralize enough veggies for a couple days worth of breakfast so that I can cook my breakfast every day. I usually do eggs in a pepper circle, but I like this idea better. And the onions sound delicious. I just don't want to have to get my spiralizer out every morning. I hear ya! They will last up to 4-5 days in the fridge! The onions last a little less and I have to warn you, smell pretty strong it's almost unbearable! Do you have any idea what happens to them if you freeze them? I and my buddies have already been looking through the excellent items found on your website and then came up with a terrible feeling I had not thanked you for those strategies. These boys appeared to be as a result excited to read all of them and already have undoubtedly been taking advantage of them. Thank you for truly being well considerate and for having varieties of excellent information most people are really eager to understand about. Our sincere apologies for not expressing gratitude to earlier.